killings because he was a mere junior to former president Robert Mugabe at the time, his spokesperson has said. George Charamba told The Standard in an interview he “hates” the use of the word architect in describing Mnangagwa’s role during the 1980s atrocities in Matabeleland and Midlands provinces because “it suggests personal liability”. He described Gukurahundi as a war. 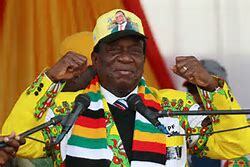 “They were part of the government of the day, which reported to a commander-in-chief, which reported to a president,” he said in response to a question on whether Mnangagwa and other top government officials identified as key players in the conflict were ready to apologise.